When Kelly O’Donnell was a child, she hated basketball and never wanted to play. In fact, her mom, Keri, once had to drag her out of the house to a youth basketball clinic at St. Columba parish, Marine Park. While O’Donnell begrudgingly went to the clinic, it was there that she fell in love with the sport. Go figure. Her passion for hoops has continued to grow through the years, leading her to the St. Joseph’s College Brooklyn, Clinton Hill, women’s basketball team. In her first season as a Bear, O’Donnell was named the Skyline Conference’s Women’s Basketball Rookie of the Year. The 5-foot, 10-inch freshman guard started all 26 games and averaged a team-high 17.8 pts. per game this season – good enough for third in the conference, second among Division III freshmen in the country and sixth among all freshmen in NCAA women’s basketball. Her 464 total points were the most among all Division III freshmen in the country, and she was the only player in the Skyline Conference with double digits scored in every conference game. She also added 8.0 rebounds and 2.5 steals per game. O’Donnell closed out her freshman campaign with a 24-game streak of scoring in double figures. She was named Skyline Conference Rookie of the Week seven times, including four straight to end the season. Her efforts helped lead the Bears to their winningest season in Skyline play. St. Joseph’s reached the playoffs as the No. 6 seed, losing to Farmingdale State College, L.I., in the first round of the conference tournament. 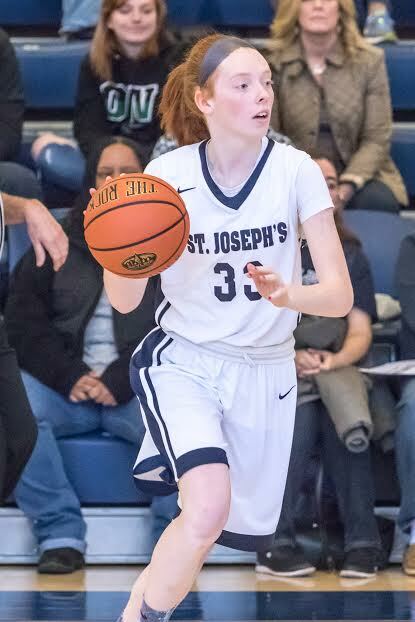 After playing Catholic Youth Organization basketball at St. Columba and Good Shepherd, Marine Park, O’Donnell attended St. Edmund Prep H.S., Sheepshead Bay, where she played all four years on the varsity girls’ team. It’s very rare for a freshman to play varsity basketball in the local GCHSAA league, so the transition process was tough for O’Donnell early on. “When I first went on varsity, I was so scared because I was a freshman and playing with a bunch of girls who were juniors and seniors,” she said. “I had the mentality that I’m the youngest one and I need to pass it and get them the ball and they’ll do all the scoring. Things turned around quickly once O’Donnell developed the confidence to know she could compete on the varsity level. As a team captain for the Lady Eagles, she was a three-time Tablet All-Star and capped off her high school career by scoring more than 1,000 points. Upon beginning her college career, O’Donnell said seeing a familiar face – former St. Edmund’s teammate and current St. Joe’s junior Kellie O’Neill – was a huge help, since the two already had great on-court chemistry from their high school days. Additionally, she credits her high school coach, Frank Kelly; her Amateur Athletic Union coach, Dewey Hopkins; and her college coach, Tom Flahive, for taking her game to the next level. “Having four years on varsity gave me confidence that I definitely brought over to St. Joe’s,” O’Donnell said. She also said her dad, Gerard, and her two brothers, Tim and Ryan, have been a great support system. Right after the season ended, her brothers told her she could take two weeks off and then it’s right back into the gym to start preparing for her sophomore year. The Rookie of the Year honors put the exclamation point on O’Donnell’s breakout freshman season. It’s also a source of motivation for the star student-athlete to keep improving – both individually and the team as a whole. Now that she’s settled in, O’Donnell is set to step up her game even further as she continues her collegiate hoops career. Not too shabby for someone who wanted nothing to do with basketball earlier in her life. Contact Jim Mancari via email at jmmanc@gmail.com.